But, how do I really feel? Subverted from its original Japanese ‘moji’ (meaning letter or character) and ‘emoji’ (a small, digital image or icon used to express an idea or emotion) – ‘amoji’ must then refer to a character that is lacking, without, or separate from an idea or emotion. ‘Amoji’ – like ‘amoral’, ‘asexual’, ‘asymmetrical’ – implies that the subject of the word is separate from the very essence of which it is made up. 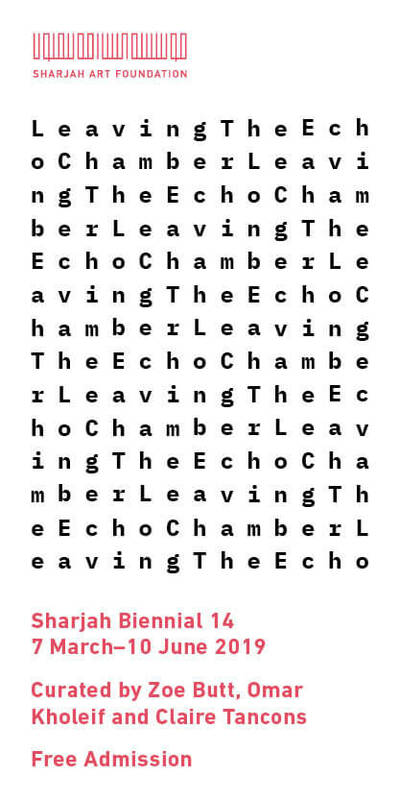 The ‘a’, when placed in front of these words, strategically subverts the signified from its signifier – perhaps demonstrating that, like Ferdinand de Saussure, “the connection between the signifier and the signified is arbitrary”. 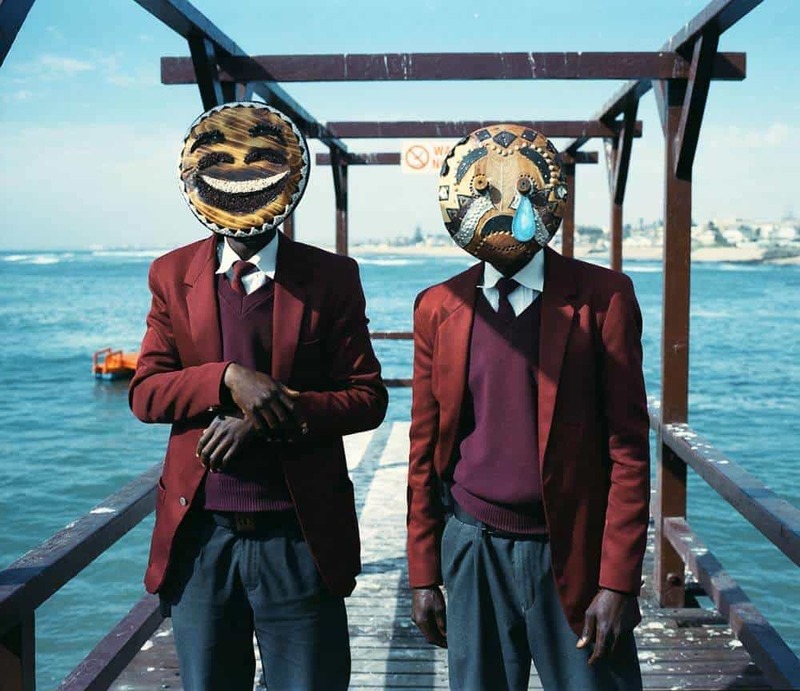 ‘Amoji Masks’ – the title of Toufic Beyhum’s latest series of photographs – was inspired by the ever-increasing connectivity across the African continent, and the inevitable clash between modern and traditional cultures. Beyhum commissioned young, Namibian artists to recreate familiar emojis in an ‘African mask’ style using both recycled and traditional Namibian materials. 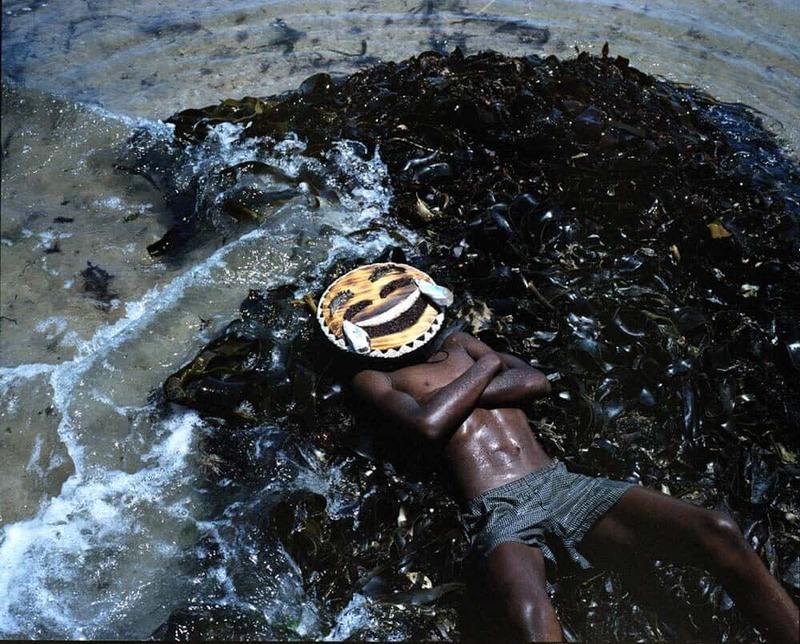 Once completed, Beyhum travelled across the country and modelled these ‘Amoji’ masks on regular people – half of the subjects were asked to choose which emoji best represented them, and the other half chose masks based either on their clothes or the surrounding environment. The result is enigmatic. In one image, Amoji Mask Embarrassed – perhaps one of the most explosive – a man stands in uniform holding a hand-held radio, and donning an ‘Amoji’ recognizable as the ‘embarrassed’ emoji. The figure and ‘Amoji’ are in stark contrast to one another – a grown man in uniform, usually read in a position of authority, consistent in conduct or opinion, would perhaps not be subject to embarrassment – defined by the Merriam-Webster dictionary as “a confusion or disturbance of mind”. He stands central to the camera’s lens, framed by a closed door and drain-pipe, and seemingly shrinks in awkwardness at the tension between who he is, what he is feeling, and his worn expression. 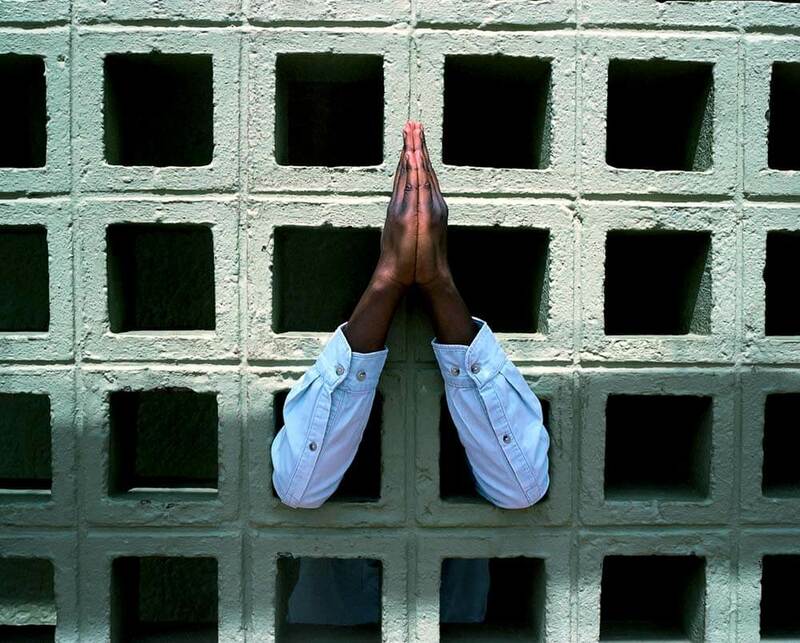 Here, as the man looks on embarrassed, his clothing and pose telling of a different story – Beyhum has successfully subverted the semiotics associated with both uniformity and embarrassment, and challenges his viewers to rethink how we read everyday symbols, images and icons – as well as how we view ourselves. Another photograph, Amoji Masks LOL and Crying, sees two school boys, also dressed in uniform, wearing opposite emotions in the form of ‘Amojis’ over their faces. The boy on the left has chosen the ‘big grin’ emoji, whereas the boy on the right is adorned by ‘distress’. Again, their clothing reveals a sense of sameness, equivalents and consistency, and is juxtaposed against the exaggerated icons representing happiness and sadness. 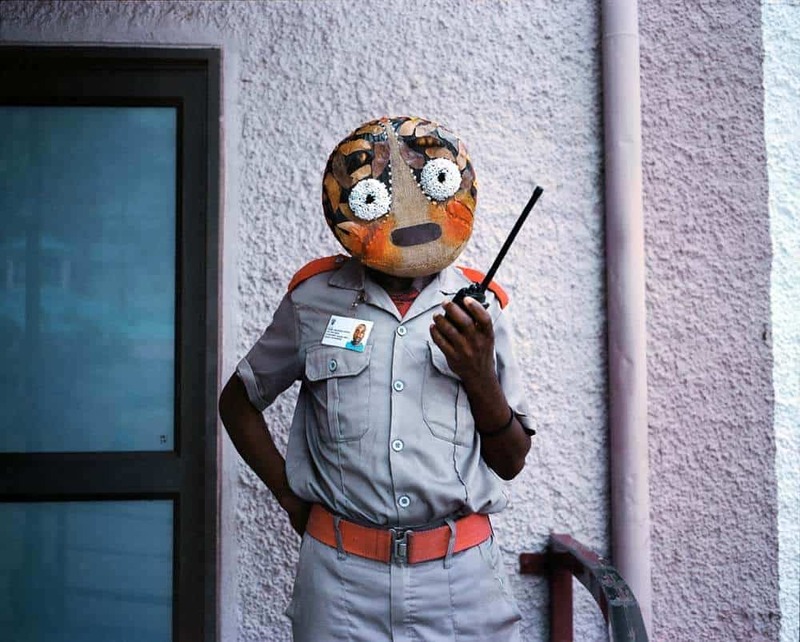 In its exaggeration, the photograph alludes to what may hide behind our ‘normal’ facial expressions and body language – the mask that so many wear may just be a façade disguising our true feelings. 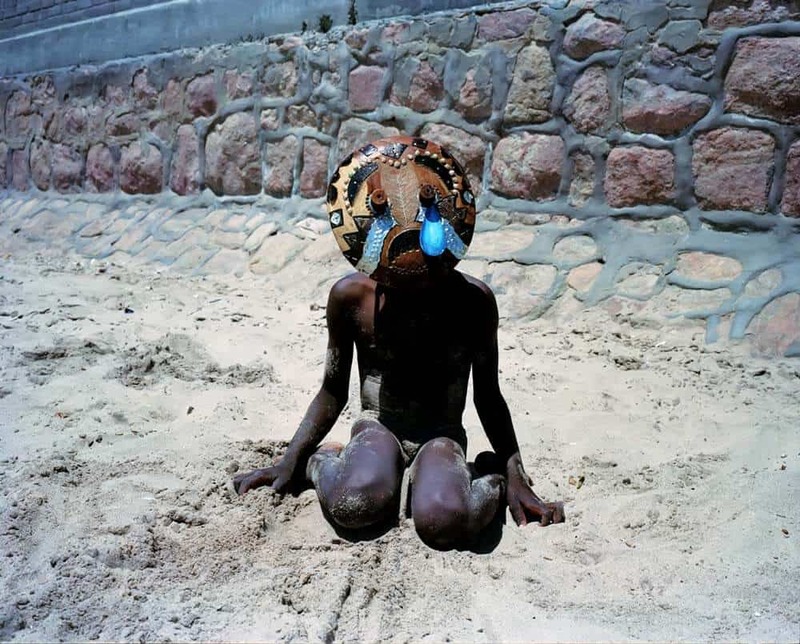 In a third photograph Amoji Mask Crying, a barely-clothed small boy kneels in beach sand, appearing crumpled in despair, as his ‘Amoji’ mask sheds an enormous tear heavy with emotion. The corners of his ‘Amoji’ mouth turned so far down that they align with the direction of his scrawny knees; his wooden eyes wide and distraught under eyebrows raised in alarm. 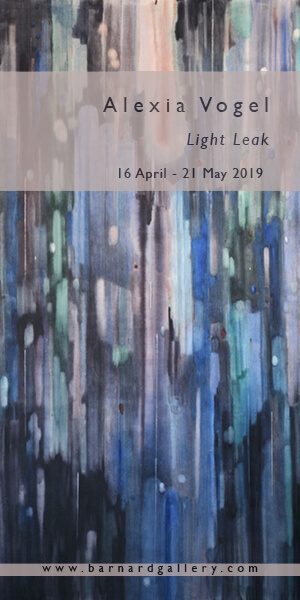 The image, of course, is an over-exaggerated interpretation of anguish, and one that perhaps offers the viewer insight into an arbitrary connection between the signifier and the signified. Beyhum’s ‘Amoji Masks’ find their strength and subversion in hyperbole. They are enormous in comparison to real-life human heads, and offer either an extreme opposition to, or amplification of, the semiotics of the photograph’s environment. The photographs strategically subvert the signified from its signifier, and make reference to a character that is divorced from the accompanying emotion – a critique of humankind’s capricious use of emojis in signifying human emotion. Beyhum has also chosen to represent other iconic emojis – almost as one would shoot a still life, product, or object. 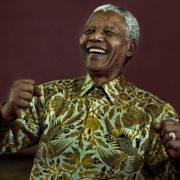 This is evident in his choice to photograph hand emojis – in one image, Amoji Flexed Bicep, a muscled, black arm pokes through a patterned, yellow cloth in representation of the ‘muscle emoji’ (power, undoubtedly); in another, Amoji Folded Hands, two arms sleeved in a blue, buttoned shirt slide their hands against each other in ‘prayer’. 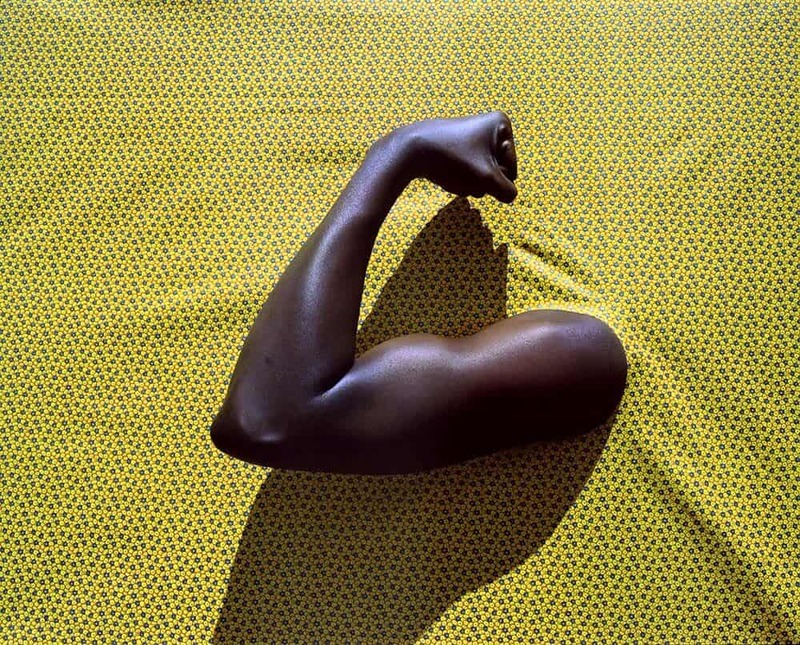 These hand and body signs speak of the non-verbal, non-facial gestures we associate with ideas or emotions – and taken with a backdrop of traditionally ‘African’ fabrics, they pay homage to famous studio photographers in Mali. More fleeting than the posed images with ‘Amojis’, Beyhum’s hand emojis capture the significance of a universal language with Africa’s inimitable mark on it. The choice to photograph his ‘Amojis’ on people going about their everyday lives may seem arbitrary, but the images present themselves as powerful metaphors for Africa’s unique relationship to the rest of the world. In combining traditional Namibian materials with emojis, Beyhum has transformed the universal image of an emoji into one that is immediately recognizable as an African motif – at once remaining true to the defining characteristics of these small, digital icons; and staking a claim for Africa in the global narrative where modern and traditional cultures collide. http://artafricamagazine.org/wp-content/uploads/2018/06/IMG_0015.jpg 805 1000 douw http://artafricamagazine.org/wp-content/uploads/2018/02/ART-AFRICA-LOGO-300x62.png douw2018-06-05 13:58:552018-06-05 13:58:55But, how do I really feel?